Modesto is an elegant portfolio theme for wordpress. You can use it to show off the best of your company’s work with a stunning theme that will wow your clients as much as your work will. You can also use the theme for a personal portfolio blog with the same success as well. 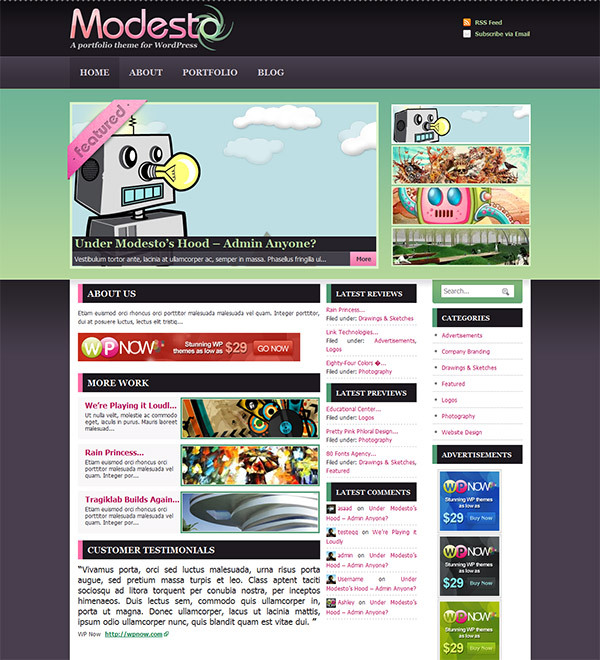 The Modesto premium wordpress theme is WP 3.0 Ready, it supports 3.0’s Custom Menus, comes with an Intuitive Theme Options Panel, a Unique “Portfolio” Template with FaceBox Imaging. You can choose up to 5 Categories for your Porfolio and there is a Separate Blog Section, the theme offers you 2 or 3 Column Layout, it supports EasyAdd for Logos, Favicons & Google Analytics Code. The theme is Widget Ready and offers SEO-Friendly Title Tagging & Meta Tagging Built-In, Easy-to-Use Built-in Ad Locations, Menu & Submenu ‘Show’/’Don’t Show’ Customization, Customer Testimonial Module, “No Sidebars” Template, “Links & Bookmark” Template, “Sitemap” Template and Social Media-Readiness – EasyAdd FaceBook, Twitter, Flickr.